500 QUALITY CLEAR BLANK - INSERT SIZE 50mm x 35mm with 25mm Split ring and Strong Plastic Connector. Designed to enable you to make your own unique promotional/gift. They can be used to put your own photos, pictures, logos, artwork etc in. Simply produce your own inserts with your pictures on, this can easily be done from your pc/printer, digital camera, etc. Cut out the insert to the correct size, pop into place and snap in cover to give a finished product. Please have a look at my other auctions to see many more products that you can personalise by inserting your own pictures and graphics. These include keyring's, fridge magnets, coasters, rulers, zippy letter openers, clocks, desk tidy, mouse mat/place mat, memo block holder, paperweights, badges, pens, and bottle openers. Produce your own gifts, promotional items, fundraising items. These products have endless possibilities. All brand new stock, manufactured to high standards. Visit my ABOUT ME PAGE. To find out more information on the products that I supply. I specialise in products that you can personalise yourself, with new products added regularly. Several of our products are also suitable for cross stitch. To see many more items that you can personalise. Have a look at my OTHER AUCTIONS. In the unlikely event of any problem, please contact me and I will endeavour to sort it out. I will always keep you fully informed should this be the case. 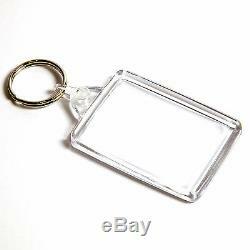 The item "500 BLANK CLEAR KEYRINGS 50mm x 35mm C102 C1 50 35" is in sale since Friday, July 17, 2009. This item is in the category "Collectables\Keyrings".